It took me and Matthew longer than it should have to work out what to do, as there didn’t seem to be an easily found solution if you searched for one online – so as an aide memoire for me, for next time it happens, and as a public service for anyone else trying to work out what to do … here’s what you do (now edited to add screen shots). Note for experts: if you’re already familiar with Styles, note that you need to change the Balloon Text. First of all: don’t panic! The comments will have typically gone into Times at 1 point. But there is a way to make them readable again. Open the document. Don’t highlight anything. Don’t put the cursor into a comment box. Now you can do one of two things. Either hit Control + Alt + Shift + s all at the same time, or make sure you’re in the Home tab and click on the little tiny arrow at the bottom right of the Styles menu – this will bring up the full Styles dialogue box. This looks like a very useful dialogue box, but for our purposes you need to ignore all of it except the three buttons at the bottom. Click on the rightmost button: Manage Styles to bring up yet another dialogue box. Now you can change your font (which will probably have defaulted to Times) and font size (which will probably have defaulted to 1). You’ll notice lots of other options (blue circle) to change the spacing, etc. – I don’t usually worry about changing those, but this is where they are if you want them – and of course you use this menu to change the styles on headings, normal text, etc., too. Press the OK button, and carry on pressing OK buttons until you get back to your document. Want even more information on customising your comment boxes? Read this article full of everything you would ever want to know! Thanks so much for this! Want to note that, using Word 2007 on a PC, I needed to highlight the whole doc before the rest of the steps would “take.” But once I made that one adjustment, my bacon was indeed saved. So glad you were there with this advice. Thank you very much for taking the time to comment, and I’m so pleased I was able to help. Having to highlight it all didn’t happen to me, but that’s well worth knowing for other people who might be in the same boat! You’re welcome – glad I can help you to impress your boss! Liz, I read this post from 2011 and am hopeful you still leave comments. My problem is the fong changes to tiny in the whole document, not comment boxes. Now I use Word 2010 but when opening older versions of documents is when it seems to happen. Thanks for your comment, Lori, and yes, I still respond to comments on all of my posts! Have you followed the specific procedure here to change only the text in the comment boxes? Have you tried setting the main text to “Normal” first to make sure it hasn’t got an odd and inappropriate style attached to it? This is a very well written solution. Thank you for posting this. I had faced this problem earlier but didn’t know how to solve this. Thanks again, very much appreciated; the tiny comment boxes were really starting to annoy me! Dear Al, I’m so happy I was able to help (and it’s good to have feedback about Word 2010, too!). And thanks for the info about the screenshots: I have been adding them to my more recent posts about more basic aspects of Word, but I think that if someone’s working with comment boxes, then they are probably OK with just following the instructions. Thank you for taking the time to comment, as it’s good to know I’m helping! This was a great help just now for Word 2007. Thanks! You’re welcome! Thank you for taking the time to let me know! Huge help!! Thanks for posting this! Hi Trish, so glad I could help, and thanks so much for posting that I had helped you! How do we rectify this on a Mac with Word? Thanks for your comment. A quick search would suggest that you use the same Styles menu in Word for Mac; again, you need to make it show you all of the styles, not just the ones it intitially offers. Have a go, and if that doesn’t work, or if you’ve tried that already, let me know and I’ll consult with my pet Mac-user, Linda. 1. 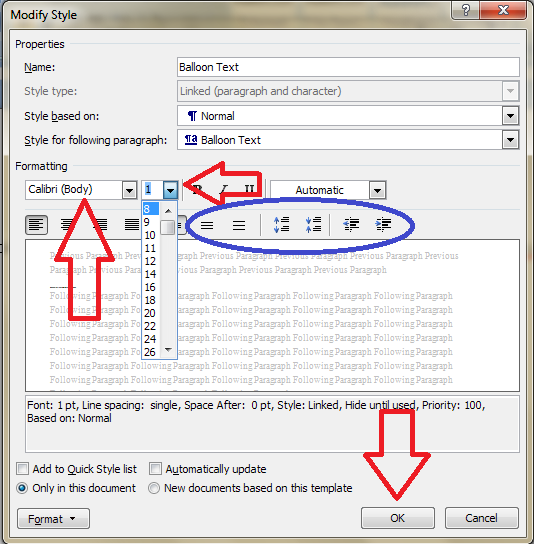 Go to the Format tab drop-down menu in Word, and click Styles and Formatting. 2. 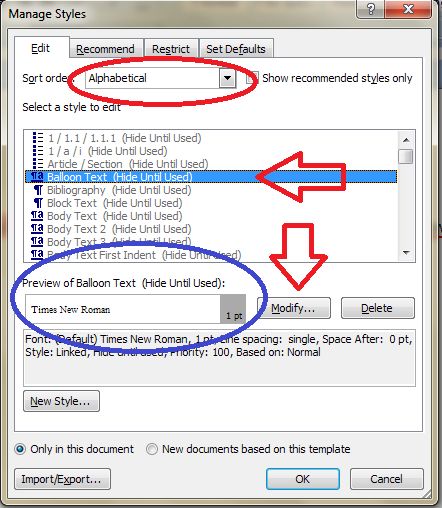 Go to Balloon text, and click Modify on the drop-down menu. 3. Change your font size as needed. Mine was originally set to “1” (! ), and I changed it to 10. Hope this helps someone working in an earlier version of Word. Now on to the fix for comment boxes reading right to left! Thanks for that, Lisa. With your permission, I will add that to the post. I don’t have a copy of Word 2003 any more, so it’s useful to have this information. Also, I wrote this post as a quick reminder to myself, and this serves as reminder to beef it up with some screenshots, like my later posts in the series. Thanks very much Liz. I had the same problem once and followed your instructions all the way to the style menu, where unfortunately I had a frustrating five minutes playing around with the ‘Comments text’. I’d never even noticed there was a separate style for balloons! I’m glad I could help – I do mention that it’s Balloon Text you need, but I’ll see if I can make that more prominent! I know it’s a bit odd, as why would you want them separate, but that’s the joy of Word! This was a big help – saved me a lot of time! I’m glad I thought to google this problem before I spent too long trying to trouble-shoot, because I never would have figured that solution out on my own! I appreciated the screen shots as well. Thanks for taking the time to comment and I’m glad I could help! Thanks so much for this. As a teacher I use the comment feature A LOT and the tiny text was driving me nuts. I once spent a good few hours trying to create and test a macro to fix this. Thanks for taking the time to let me know this has been helpful for you! Thanks for your feedback and glad I could help! Thanks for this…This was soooooo very helpful….and saved my time…. Thanks so much…saved me a lot of time – I would have never worked this out on my own – very helpful step by step guide! Thank you – glad I could help! Thanks so much, very helpful and very straightforward guide to sort out a problem I would not have been able to figure out myself…it felt like Alice going down a rabbit hole, one table after another! Wonderful instructions! You saved my day! Glad to help – thanks for letting me know! I don’t know how many human hours you’ve saved so far but certainly for me you saved many hours of panic and anxiety. Thanks a lot. You’re welcome; glad to help and thanks for dropping by to say thank you! Thank you so much, this hasn’t quite saved my life, but definitely saved me time and angst! Thanks for taking the time to comment and glad I could help! Thank you! When I encountered this problem, I was the middle of editing my students’ papers to give them some advice before they submit them to me for a grade, and without having the comments readable, my task would have taken hours longer! What a relief – so glad I could help you (and your students!). Thanks for taking the time to leave a comment! Thank you Liz, this was driving me mad !! Glad I could help and thanks for posting a comment! brilliant! I would never have found that without your help! I’m glad I could help; thank you for posting a comment! This solution came in very handy today at work. It was exactly as you described. Thank you very much and may God bless you. Thank you for your kind comment, Andrei – so glad I could help! Thank you very much, I had no idea how to solve this until I read your link. I really appreciate the help! Hi there, I’m afraid I can’t remove that myself for you. But at the bottom of the notification email you should have a link to manage notifications or some such message. Click there and you get a list of your notifications, which you can then untick to remove notifications on new comments on this and any other comment threads or, indeed, blogs, if you have signed up for emails from any. Hope that helps! Thanks so much for the steps. It Works! Thanks – glad I could help! Thank you. Great fix. Works just as it’s supposed to. Thank you for taking the time to comment and glad I could help! Thank you so much for posting this helpful fix! saved my life!! Thank you for taking the time to comment, Pam – I’m glad I could help! Thank you for your comment, and I’m glad to have been able to help you! Joining the crowds of thankers, here. 🙂 Thank you so much, this is just what I needed! Saved me a LOT of fiddling around in Word! Thanks for taking a moment to say thank you – it’s great to know I’m helping so many people! You’re welcome – I’m always glad to help and it’s lovely to hear back from people who I have helped! So helpful! Saved me and my boss lots of stress. Thank you so much Liz. Thank you for taking the time to leave a comment, Hannah, and so glad I could help! Thanks a ton. this was a life savior for me. This has just helped me sort out comment boxes that were spreading all across the page (making them equally unreadable) – I would never have found the right part of Word to adjust this in without having read this. Thank you! Ah, yes – the cousin of this piece “What to do if your comment boxes go HUGE in Word …”. I should add that to the index, actually! You’re welcome – thanks for letting me know it helped! Thanks very much for documenting this. It solved my problem. Just wanted to let you know that…wow…simply wow…In a few short words I cannot thank you enough. Thanks for taking the time to comment, and glad I could help! you must be an angel! thank you! Glad I could help! These comments make it all worthwhile! Thank you so much! All the other solutions I found posted did not work. Appreciate your help. Thank you…exactly what I needed. Brilliant! Thank you. I tried many sites for assistance with this to no avail; and then fixed the problem with ease using the tips that you provided. Thank you soooooo much that worked a treat. You’re welcome – glad it came in handy! Thank you so much!! I found this right away on Google search & your step by step instructions are greatly appreciated!! I thought, my client was going to kill me… d’oh. Thanks for your comment, and I’m glad that I could help! Thanks for taking the time to comment, and I’m glad I could help! Thank you so much, I was struggling with the issue of the coment box since yesterday night!!! You’re welcome – I started writing this whole series of posts when I couldn’t find a solution to this problem myself! You’re welcome – always glad to help! You’re most welcome! These comments really make me smile! You’re welcome – very glad to help! Thank you! Whew. Another document saved! Judging from the comments, this is a pretty common problem. You’d think Microsoft would fix it, huh? I’m grateful you posted this! You’re welcome – I think I also get so many comments because there are not many reliable sources of information on this problem. 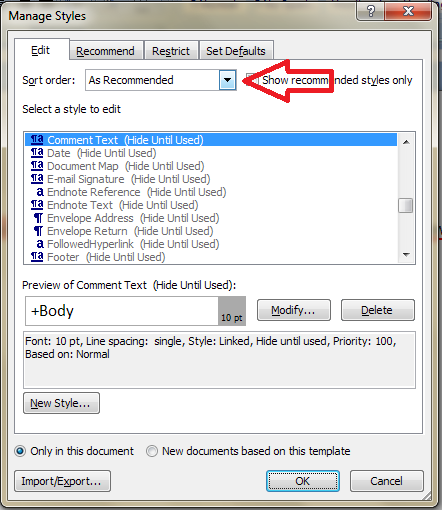 I’m not sure whether it happens so much in Word 2013; it would be interesting to know the versions people are using! Cheers, you saved me heaps of grief. Curse microsoft! Thanks for your comment, glad I could help! Thanks for taking the time to tell me so! Thanks, This was Very Helpful ! You’re welcome – thanks for taking the time to let me know it helped! Thank you for this. I was in despair after editing a long, heavily formatted taxonomic chapter which I could not afford to cut and paste as text and lose all the formatting. This worked like a charm. In Word 2007 the ‘Manage styles’ is just an icon for me (the third one AA plus pencil) – but once you select it then all flows exactly as you describe. Wonderful solution. So glad I could help – comments like yours make all the hard work I put into this blog worthwhile! Thanks for the 2007 tip, too! Good job mate!! you really saved so much time for me. Thanks for taking the time to post, glad I could help! Brilliant instructions – so clearly expressed – thank you, and well done! Thanks, Andy – it makes all the hard work worthwhile when I read a comment like this and know that I’ve achieved what I set out to do with a post! Thank you for your comment. All of the relevant links to RSS, email subscription and my newsletter are to the top right of the screen when viewed on a desktop computer. The links are at the bottom of the page when viewed on a mobile or tablet. Thanks for your comment and I’m glad I could help! Thanks for your comment, Palmi – this was my very first post in this series, and I wrote it for myself in case I needed the solution again! I’m visiting your beautiful country in June, by the way! Thanks very much for this article! This was a great help. Finally!! !…Thanks a lot for this step-by-step explanation. It really saved my time which I would have otherwise spent trying to understand what went wrong with my word file..Thanks again!!! Super, super helpful. Thank you for taking the time to show screen shots! Amazing! Thanks – saved my bacon again! Clear and brilliant as always. Liz, your an angel. Thank you sweet girl. Liz – Thanks so much for the clear instructions (and screen shots) on removing the very TINY text. The instructions were very clear and solved my problem. So glad I could help! Yes, it does go extremely small when this happens, doesn’t it! just what I was looking for! thank you for sharing, saved a lot of time for me! You’re welcome – glad I could help! Do use the buttons below to share the post with your network if you think it would help other people! Glad I could help – it’s hard to find info on this which is why I wrote my original blog post on the topic – for myself! Thank you so much, You saved my hours of time. You’re welcome – thanks for taking a moment to comment on my article! Thank you kindly. I was stumped by this issue, your article was perfect. Thanks for your comment; glad I could help! Thanks – but this does not seem to work for Word for the new iMac pro. Back to googling online. Thanks for the comment – I had forgotten to add to the bottom of this post that these tips work for Word 2007, 2010 and 2013 for PC but can’t be guaranteed to work for Mac, but have added that now. Let me know if you find a solution for your particular version and feel free to share it in a comment for other readers to see. Perfect, just what I needed, thanks. And with a title that ‘did exactly what it said on the tin’. You’re welcome – really glad to be able to help! Thank you. My Mac has some differences from your basic instructions but with your help and a bit of random thrashing about I have managed to change the font size. I probably would never have got there without you. Excellent – thanks so much for letting me know this blog post helped you! Thanks so much! Your step by step guide saved my loads of time! Thanks again!!! Thank you, you saved my life! I loved the visual instructions you provided because I hate using Alt + Shift + etc + etc; they usually confuse me. I am a Mac person whose wallet has forced into PC slavery. (And let’s not even mention Windows 8!) Oh, I miss my Mac. So glad I could save you some pain and that the way I do the instructions helped! My problem is in Word 2003. I go to the format drop-down and choose “Styles and Formatting” but I don’t see “Balloon Text” anywhere? Nevermind, I figured it out. I have to go to the bottom of the Styles and Formatting area and select the drop-down for the “Show:” box and choose Custom. The balloons box wasn’t checked off so it wasn’t appearing. I followed your steps from there. Thanks! OK, great, sometimes Word likes to be “helpful” in terms of what it shows us! Thanks for sharing the solution, too! Evn though I have clearly selected Tahoma size 8 as the prefered font type, Word 2013 will only change the first balloon correctly. All others (including new additional comments) are all shown in Times New Roman size 10. Hm, interesting. Have you pressed all of the OK buttons as you go back through the stages to the main Word screen, and ticked anything that might ask if you want to continue working in that format for all other comments? Very useful thank you – had no idea what had gone wrong and was pressed for time with an important document. You’re welcome – glad I could help to save the situation! This is fantastic! Thanks for this very, very helpful and detailed description! Thanks for taking the time to comment and I’m glad I could help you! I’m glad I could help, Jaroslav, and thank you for taking the time to comment! Thank you! this issue was driving my nuts. Great, great advice! And thanks from another Karin – I have just got back from a break and found a document a client had returned had this problem. A google search came up with your post first and I was quickly able to deal with it. I’ll now bookmark the page in case it ever happens again. Thank you so much for this – it’s been a total lifesaver this morning! Thank you!!! This was driving me nuts as I couldn’t figure out why they couldn’t be seen. I had tried highlighting the comment box text and increasing the font size, but it didn’t help. Definitely wouldn’t have come up with this solution myself! Thank you!!! This was a real help. Was stuck on this since so many days. It was a savior!! Thank you for the help! The problem has tripped me for a while until I found your post. Thank you very much. I had no idea how to do this, was in a hurry but quickly found your very clear advice. Thank you. Thank you. Thank you. Did I mention “thank you”? This was a big help! Incredible. Thank you. Don’t know how you figured this out, but I’m sure glad you did! Whew. And, in case I haven’t mentioned it, thank you! You’re welcome! I can’t remember how I worked it out now, because it’s the first post I wrote for this series on this blog and did come out of horrible experience! Glad I could help! You’re welcome – it’s a tricky problem, but it started off my whole Word blog post series! Ok thank you very much for posting this. Thanks! Was very helpful! Also the screenshots were amazing!! Thanks so much! I never would have figured this out on my own. I loved the step-by-step instructions and screenshots. Thanks again. Thank you so much, that is exactly what I needed this morning. So helpful! Awesome and thank you saved me heaps of time. Thank you for commenting – glad I could help! Thanks for going to the time and effort to put this up. Has saved me hours of frustration trying to find it through the WORD help! Thank you for taking the time to comment! Glad I could help! Yes, saved my bacon! Great advice and easy to follow. Thank you, you have saved me hours and my sanity. Saved my bacon in Word 2010. Thanks heaps. I’ve never had this problem before, so thank goodness you posted the solution! Mercy mille fois! Stuff that works!!! I looked a genius in our office after reading through and following these steps!! Great stuff. This was incredibly helpful and saved me a lot of time and frustration. Thanks for posting. Thank you SO MUCH for this, it was such a huge help and a quick fix. Brilliant. Thanks a million! Now why is this so hard to find online? Bookmarked and promoted! I don’t know why this is so hard to find online, but I know that it is, because that’s why I wrote this, my very first Word Tips blog post, primarily for myself when I first encountered the problem! Thanks for sharing the post! Thanks. This helped. It was quick and painless! Thank you very much, Liz. I was trying for like an hour before I googled and found this. THANKS. Thank you for saving my workday too! I could’nt find anything about this problem in Portuguese. Thanks for this. Solved an annoying problem. By the way another way to get to the Balloon Text style is to click in the list and then press ‘b’ three times (in my list of styles anyway). I’m glad I could help, and thanks for the shortcut! This just saved me so much time and trouble, and I’ve been struggling with this problem for a while. It works on newer versions of word although the menus are slightly different. Thank you! Glad I could help – there’s a space for someone to do all of these for Mac, I think! Very useful information…it helped me o get going on a task which otherwise was halted due to this problem. Many Thanks…& great job…!! Yes! Life Saver! Thank you very much. Thanks, would never have figured this out in a million years! One note some of the screens were slightly different but the process was the same!!! Thank you so much! This information turned what would have been a nightmare afternoon of editing into a normal job. I have no idea how you finally found this fix, but perhaps you should go into detective work. I found it buried in several corners of the Internet – this was the first blog post in my Word tips series that I wrote, and I wrote it initially to have a record for myself for when it happened again! I’m so glad it’s been useful for so many people. Thank you so much for this information.. saved a lot of time! Thank you for this post. I struggled to fix the same problem. Thanks Google, so I could search this problem, and Thank you for posting this to help others like me. Another thank you for this very clear, explanatory post! Many thanks for this solution. Very helpful. Certainly solved my problem. I had this problem today. I googled it, and you were the first result! I was pleased to find the exact solution to a very strange problem so quickly. Major thanks! I appreciate your straight forward way of expressing how to make the change! Thank you Liz, it helped. Very helpful advice. It’s frankly amazing how complicated it is to fix the problem – would have taken me ages to stumble upon these hidden format dialogs. Since this is *still* an issue in Word 2016 (but now Balloon Text is set to Always Hidden), we still owe you thanks after all these years! Your knowledge sharing is highly appreciated. Ah – that is interesting to know – thank you! My afternoon was rapidly circling the drain when I came across your post. I kept changing the Comment Text style and getting increasingly frustrated when the tiny boxes refused to go away. Who would have known you had to change Balloon Text and not Comment Text? It doesn’t help that Balloon Text is hidden from the list of available styles by default, so you have to know it’s there to find it. Thanks for saving my day. So glad I could save your day. I wrote this after having a similar day myself! I love the fact that this post is still helping people when I wrote it ages ago, mainly as notes for myself! Glad I could help! Thank you very much for helping me to recover the text size in comment lines. Thanks a lot !!! Thank you so much Liz! I was facing exactly the same problem and this helped me bid time. Glad to still be helping with this one! Thank you very much Liz. I was facing exactly the same problem and this helped be a lot. Thanks for this, Liz. A great, simple fix. It took about 2 minutes to resolve with your instructions. Thanks for this. Very helpful – came up on my first google search to find a solution to this problem. People like you make the internet! Thank you for making the effort to post this very helpful info! You are my hero. I’ve just been upgraded 😛 to Office 2013, so it’s a tiny bit different (the >manage styles< button is one of three buttons with icons that you have to mouse over to figure out what each does), but it would have taken FOREVER (the canine perception of time according to George Carlin) for me to figure that out on my own without your clear instructions. A thousand blessings upon you and your'n. Really glad I could help and thanks for that note, I will get round to adding it to the article. I’m so glad this is still helping people, five years since I wrote it! Thank you! Fixed the problem straight away. Easy to read solution!! Absolutely saved me at least an hour searching around. Who would have thought immediately that “balloon text” style would control this??? So helpful! Looked at a bunch of thread on this question, this was the only one that was clear enough to help me fix the issue. Thx!! Thank you! Your instructions were spot on! Bless you! I should have known it was in Styles. Balloon didn’t come up at first in the Edit list like other readers mentioned but it was in the Restrict list. When I clicked on it there, it came up on the Edit list. Brilliant thank you so much for very clear instructions. Extremely clear. Solved my problem immediately. Thanks a lot. That saved me a few hours! Thank you for posting this with clear instructions. My sanity is saved. Thank you Liz – I love you!!! I love this article – helping people for years and years! Thanks! This was very helpful. initially it didn’t work for me because the formatting was with respect to “complex scripts” and I had to change to “all scripts” before it would work. I hope you can help me out here, Liz! I know we can expand the widt of the revision balloon but is there anything to expand the height so that it shows ENTIRE comment you have placed in the revision balloon? Rather than clicking on the down arrow and seeing the comment. This is a problem I haven’t seen before! Which version of Word and for PC or Mac? Glad this post continues to help! Thanks – fixed it! Appreciate the easy solution. I’m always glad to be able to help! You’re amazing for posting this solution. Thank you so much! It didn’t occur to me to check the styles box; thank you for the solution! If you’re using Word for Windows versions 2007 to 2016, this process should work if you follow every step exactly. Let me know if you have a different version. I know, right – it’s the blog post that keeps on giving! I’m always glad to keep helping people! Wonderful! Thank you – I wish I had searched for advice before I spent so much time trying to figure it out. I was never going to find that. Saved my tofu! Thank you for your comment. I love that my first one of these articles is still helping people, years and years later! How on Earth did you find this solution?! but thank goodness you did and published it. Thanks a million! Hi, Thanks a million, this really helped! Glad it’s still helping people! Thanks a lot for putting this info out here. It was very clearly written, easy to follow, and very helpful!